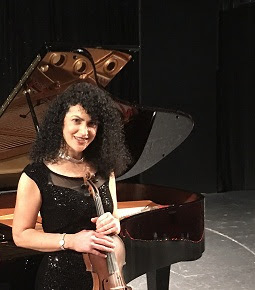 Friends of Music launched its 2018 series at the Durban Jewish Centre on Tuesday (January 16) with a recital by the American violinist Miriam Kramer and her regular partner, British pianist Nicholas Durcan. Engaging these distinguished artists, who delivered an evening of superb music making, proved a major coup. They opened their finely curated programme with Bartok’s six contrasting Romanian Dances, written for piano between 1915 and 1917, here arranged for violin and piano by Zoltan Szekely. These were followed by the sublime Adagio from JS Bach’s Sonata No 3 in E Major BWV 1016 for Violin and Keyboard, music straight from heaven if ever there was. The centre piece of the evening’s programme, Sir Edward Elgar’s highly charged but rarely heard Sonata for Violin and Piano Opus 82 was performed with both intensity and tenderness, evoking the sense of nostalgia that is a hallmark of Elgar's oeuvre, particularly his late compositions. Composed in 1918, while staying at Brinkwells Cottage in the idyllic woods of West Sussex in England, the Sonata was among the last works he wrote. As a timely nod to the current upsurge of global women’s solidarity, Kramer and Durcan opened the second half of their programme with an impromptu inclusion of the charming Romance Opus 23 by the American composer, Amy Beach (1867 – 1944). The varied pace and tone of the programme continued with idiomatic performances of Robert Schumann’s Fantasiestucke Opus 73; two tangos by Astor Piazzolla, Oblivion and Libertango; and Swiss Jewish composer Ernest Bloch’s passionate Nigun (from Baal Shem). The evening ended with Kramer’s bravura account of Pablo de Sarasate’s flamboyantly virtuosic Zigeunerweisen Opus 20, which brought the audience to its feet.